Since 1905 the Staten Island Ferry has provided service between Staten Island and Lower Manhattan, and its one of our favorite venues because it has three of our favorite things associated with it; it's free, it's a mini cruise ride and you'll see fantastic views of some of New York City's most memorable landmarks. Hop on board the Staten Island Ferry enjoy a free 5.2 mile river cruise any time of the day or night, 365 days a year. During the approximately 25 minute trip, you'll get a fantastic view of the World Trade Center and the rest of Lower Manhattan, South Street Seaport, the Statue of Liberty, Jersey City and perhaps a cruise ship leaving out of New York Harbor. Then double the fun by riding the ferry back to Manhattan from Staten Island. Riding the Staten Island Ferry is a great way to experience something many "Native New Yorkers" do every day, and best of all, you can do it for free. 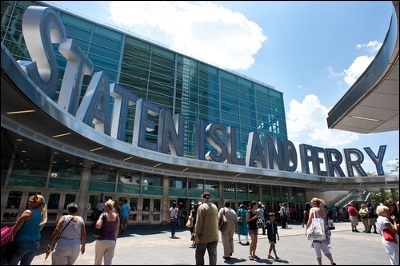 There are gift shops, restaurants and a beautiful waterfront to enjoy once you reach Staten Island. NOTE: Sometimes it can take up to 30 minutes before a ferry makes a return trip to Manhattan. Plan accordingly. Manhattan - Whitehall Terminal - 4 South Street - at Whitehall & South Street. Preferably 4 or 5 train to Bowling Green Station. R train to Whitehall Station. 1 to South Ferry Station. Follow the signs to the Ferry. M1, M6 and M15 bus. The Staten Island Ferry has been ferrying people between Staten Island and Lower Manhattan since 1905. The NYC Department of Transportation runs the ferry service, and on a typical day, 5 Ferries make the 5.2 mile trip 109 times at service speed of 16 knots. While cars are not allowed on the Staten Island Ferry, service animals and pets in crates are welcome.